Mid-Continent Railway Museum’s restoration of Chicago & North Western #1385 was recently named one of the winners of the first ever round of grants offered by the John H. Emery Rail Heritage Trust. The grant gives the C&NW 1385 project a $10,000 boost toward the production of a new boiler. A new boiler is major component of the 1907 locomotive’s overhaul to make it steam-worthy well into the 21st century. 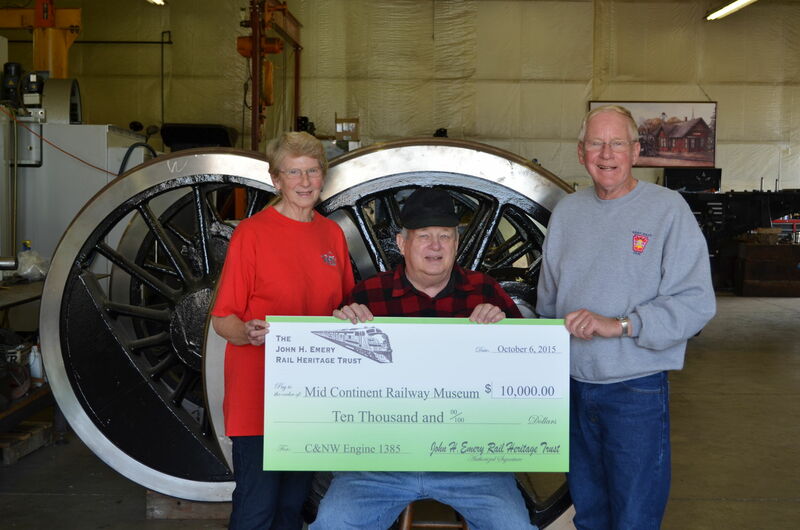 Tom Sharratt and Naurine Lennox present a $10,000 check from Emery Rail Trust to Mid-Continent Railway Museum, accepted by museum President Jeff Bloohm. The grant is in support of Chicago & North Western #1385’s new boiler. Sometimes referred to as Mid-Continent’s “ambassador of steam,” the C&NW #1385 was the first steam locomotive ever operated by Mid-Continent Railway Museum in 1963. In the 1980s it was used by the Chicago & North Western Railway as their goodwill ambassador to the public, traveling extensively on the C&NW network and bringing operating railroad history to many thousands of people in their hometowns. At Mid-Continent Railway Museum’s North Freedom, Wisconsin location, the locomotive was often seen in service pulling museum visitors up and down the former C&NW branch line which Mid-Continent calls home. To help re-create and preserve, to the extent possible, the rail passenger travel experience as it was in the U. S. from approximately 1920 through 1960. To preserve and restore to working order rolling stock and other working artifacts from the “Golden Age” of the U.S. rail passenger service. The emphasis shall be on organizations that offer the general public an opportunity to ride historically significant equipment over historic rail lines. The Trust may, however, support organizations that would use modern equipment to restore passenger service over historic rails, or to build new rails on which to operate historic equipment in passenger service. John Emery, a native of Chicago and lover of classic passenger trains, founded the Trust as way to support ongoing efforts to preserve examples of America’s great passenger trains. Emery was a world traveler, visiting over 125 nations. As an avid railway buff both abroad and in the U.S., John rode the rails as often as possible. Utilizing his talents as a businessman, investor, and accomplished writer, he grew to become a great philanthropist, sharing his success through multiple foundations. Emery passed away peacefully in 2012 at the age of 75. Now his legacy lives on through the foundations he established and the Advisory Committee now appointed to continue his philanthropy. In all, 11 grants totaling $162,500 were awarded in this first series offered by the Emery Rail Heritage Trust. Grant winners spanned the country from Tennessee to New England, New Mexico to Michigan. Among the grant winners were several other steam locomotive restorations, rolling stock, and infrastructure projects.